A lush, well maintained garden compliments the look of your house. An unmaintained, dull and stiffened lawn mower can completely spoil the lawn grasses, leaving them torn off and not well trimmed. Torn off grass tips also invite plant-related diseases. 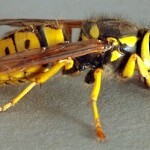 This can lead to a complete disaster of the lawn eventually. Sharpen and maintain your lawn mower blades to keep your lawn healthy and lush. 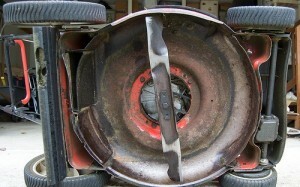 Here is a complete procedure given below of how to sharpen lawn mower blades. This procedure is completely safe and cost effective. Find out how you can do it yourself. Keep the following things handy while sharpening the lawn mower blades. 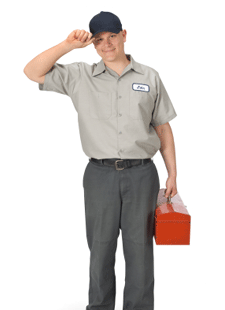 Take care of a few things while sharpening the lawn mower blades to avoid any unwanted mishap. Wear a thick pair of gloves to avoid hurting yourself while sharpening the blades. Disconnect the power spark plug from the socket. Pull off the wire from the socket’s end. Empty the power gas tank. If it is an electronic lawn mower then disconnect the electrical power cord completely. Clean the hub of the blades with a nylon brush. Clear all the grass and debris to access the blade nut easily. Removing the blades from the mower happens to be the toughest part of the job in the whole process. Let us make the process easy, safe and less time consuming. Keep in mind that all the blades are joined to one single bolt in the middle. Oil the bolt in the middle and leave it for about 15 min. Block the blades with a wooden chunk so that they do not spin while removing. Now open the bolt loose and remove the blades carefully. Clean the left over grass particles from the center bolt to ensure proper fixation while remounting the blades. This is the most important part of our entire procedure. Check with the manufacturers about the angling of the blades. It is usually written on the box of the mower. Every mower has different angle setting. Be careful not to spoil the angling of the blades while sharpening. Place the blades on a work bench and fasten one end of the blades keeping other end unfastened. If your lawn mower does not come with a sharpening kit then a grinding wheel or a file can be used for the job. Use long strokes in a single direction to file the blades. Make sure the strokes are drawn evenly and from tip to end. Clean the metal dust after every second stroke while filing the blades. This will help keep a tab on the uniformity of all the parts of the blade. File the blades with same number of strokes to maintain uniformity of all the blades. Keep a bucket of water and dip the blades into it on and off to keep it cool while filing. When the blade heats up it loses its rigidity and is likely to get deformed. Grind or file only until the edges are sharp enough. Do not wear it off. Check the sharpness by using it on a paper. Always remember that the manufacturers spend hours angling the blades for the right trimming of the garden. So check for the straightness and balance to give the lush lawn a perfect trimming. Get a blade balancer and check the balance on that. As mentioned earlier also, file all the blades with equal number of strokes to leave the same amount of metal on the blades after filing. Do not try to straighten or bend the blades forcefully from its original angling. Once the mower blades are sharpened and cleaned off the metal dust from filing, it is time to put the blades back to place. Put the blades back into the mower and tighten the bolt. Check carefully while tightening that all the blades are set properly in the hub. Carefully turn on the power and check whether it is spinning properly. A few regular maintenance steps can decrease the work load of sharpening the lawn mower blade. Clean the tiny grass particles or debris from the mower with a nylon brush after every session. Do not let the mower roll over stones in the garden. Try to sharpen the mower blades once in every 6 months to avoid immense effort in sharpening it after an era. If the lawn mower comes with a sharpening kit then read the instructions carefully and follow them ditto while using. Let the lush lawn keep adoring your cozy house. Keep room enough to bag the unending compliments by the guests on your thriving lawn. 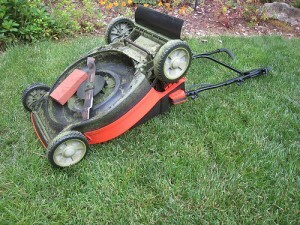 Keep your lawn mower and its blades well maintained to keep the lawn in great shape as you want it. 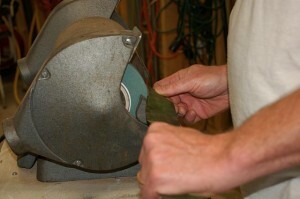 Got more ideas about how to sharpen your lawn mower blades? Please share them with our readers.